Natural Touch Wedding Flowers, Silk Bridal Bouquets, Real Touch Wedding Bouquets. 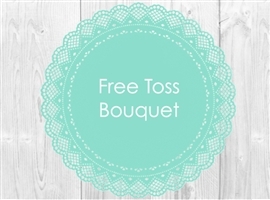 ORDERS over $250 (excluding S&H) are eligible for a FREE SMALL TOSS Bouquet with matching Flowers and Colors to your Wedding in Specialty Quality. Please click on the link above and add this item to your shopping cart, then use promo code "FREETOSS" at checkout. The Toss Bouquet will be made to match your order colors and flowers in Specialty Flowers. If Specialty Flowers are not available we will upgrade it to Natural Touch. Natural Touch Toss Bouquets will have between 3 to 5 Flowers, depending on the design of the bouquet. Free Toss Bouquet for orders over $250!